Will Mobberley touches down for Warwick School. Warwick School Under-15s were left heartbroken after a dramatic conclusion to their National Schools Cup semi-final saw Manchester Grammar (MGS) overturn an 18-point deficit to triumph 22-21. Warwick produced some outstanding moments and took the lead when winger Will Mobberley intercepted in his own half before winning the footrace to touch down. MGS captain and fly-half Ben Simpson soon narrowed the deficit after slotting a penalty from in front of the posts but with Warwick continuing to apply pressure, second-row Max Stanton charged down an attempted clearance and collected the ball to dot down. Early in the second half Kai Nwangwa, Warwick’s openside flanker, spotted a gap and made a break, beating several defenders on the way to the try line. With Tanner adding the extras to make it 21-3 there looked like no way back for the Manchester side. However, they showed enormous character to work themselves back into the game. 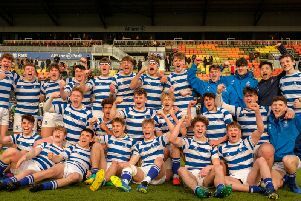 Finding themselves on the wrong side of the referee, Warwick found it impossible to get out of their half and Manchester Grammar began their recovery when second-row Noah Ellis crashed his way over the line. Then, in the 50th minute, centre Haeden Johnson, who had looked dangerous throughout, forced his way over. Simpson’s conversion brought the score to 21-15, giving his side a hope of completing a tremendous comeback with ten minutes left on the clock. And, in the dying moments, with Warwick desperately trying to keep MGS out, scrum-half Tom Archer picked up the ball and sprinted over. The conversion left Warwick trailing for the first time and they had just enough time to regain possession. However, they conceded a penalty which allowed Manchester Grammar to kick to touch and celebrate a remarkable turnaround.